I dropped this article in on Sunday rather than Monday to save readers from any unnecessary booking panic on Sunday night! IHG Rewards Club was due to change the reward pricing of almost 700 hotels on Monday. 80% of the changes are increases. The good news is that only about 15% of IHG’s hotels are impacted, and so only about 12% are going up. The 70,000 point cap remains, and no additional hotels are moving into the 70,000 point category. The implementation date now seems to be 25th January. The date on the list of impacted properties has changed and no longer says 14th January. The list of hotels changing category can be found here. 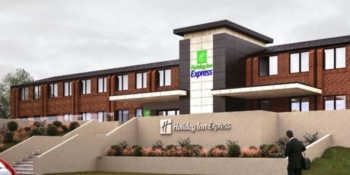 Examples of hotels changing category can be found in my original article here – the Holiday Inn Express in Wigan, pictured below, is dropping by 5,000 points. The Groupon ‘cheap Avios’ promotion in Spain, with Iberia Plus, is back again. Click here for details. The cheapest – and best value – 2,000 Avios package has already sold out despite the offer only just launching. You were only paying €19 for 2,000 points, which is 0.84p each. Whilst these deals were administratively messy when they first appeared, I get fewer complaints these days. The IT seems to be working better now. Of course, all of the information is in Spanish but Chrome can translate the page for you. The Groupon Spain page you need is here. Garuda Indonesia is changing its Heathrow to Jakarta service in late January to include a stop in Bali. This is good news for anyone considering a trip to Bali, but bad news for anyone who has already booked a flight to Jakarta and who will now see their travel time extended. Operating on Tuesdays, Thursdays and Saturdays, this will be a triangular service operating London – Bali – Jakarta – London. Whilst you will have a direct flight TO Bali, your trip home will involve a change of plane in Jakarta. The flight is operated by a two-class Boeing 777-300ER. I reviewed Business Class on Garuda’s Boeing 777-300ER aircraft back in 2015 – click here – when Garuda was flying London – Amsterdam – Jakarta and you could buy the European leg separately. Garuda Indonesia is a member of the SkyTeam alliance which means that this flight should be redeemable with Delta SkyMiles, Flying Blue miles etc. How to earn Avios booking hotels via Agoda - and is it worth it? I have the Plat “200 off 600” Amex Travel offer, and am looking to us it for a flight / Car rental booking for DFW or HOU. Flight alone should be easy, but can I amend the rental booking later without penalty (as AT dont offer the rental category with Hertz that I like to use). Also, are Amex Travel restricted to certain airlines? OT-Any idea when is BA Blue card sign up bonus going to increase from current 5000 Avios to 9000 Avios. Hi Roger I’m sure the 5k sign up bonus is the enhanced level (standard is 3k). I’ve never known it to go to 9k? Although if you’re referring, the other person will receive 6k currently. Pretty sure there has been 9k in the past but not – untargeted – for years. I do remember my very first BA Blue (may be back in 2012/2013) was 9000 Avios. Maybe a year and half ago it was 9k, possibly two years. Don’t think it was more than that. It used to vary between 9k and 3k, but recently only 5k or 3k. They may push it up again but it’s starting to look more and more unlikely. On a similar referral scenario, when referred from Amex platinum the card sign up bonus is not enhanced. Don’t agree. Have the points actually posted or are you just seeing the counters? Counters never show the uplifted amount in my experience. OT – thought I was being clever with a QA flight I booked last week to Chennai via Doha. I have an 18 hour stopover outbound but had planned to have a swift mooch round the city but it just occurred to me that QA may check my luggage through to Chennai. Is this likely or is an 18 hour connection to long a time for them to retain my luggage? If the former, does anyone know if there will be any restrictions on me going landside with my hand luggage? You are fine. They will keep the luggage, and ok with hand luggage. Keep out essentials tho! Visa free on arrival too. Have they given you a hotel coupon in that free hotel campaign they had going? Anyone else getting Zero points offered for partial surveys. Thought it was a mistake, quickly failed 4 and zero points posted. Shame was a quick way for a quick 25 -50 points for each one. Sounds like a deal with the London Mayor to make themselves look good and get reinstated? Also Mayor, of course, looks good…. lots of spin opportunities on this one! And the customers just pay more… Win… win… er…. nope. not a win for customers. OT – Lloyds Avios Rewards cards. Still haven’t had notice of the account closing/terms changing. I got a new AmEx card (with 2022 expiry date) through the post the other week but no sign of a new Mastercard yet. My current one expires at the end of the month and I’m relying on it turning up to get in one final upgrade voucher before the card closes – has anyone had a replacement Mastercard turn up a long time after the AmEx? Just checked random dates for IHG properties in Moscow and cash rates are cheaper or just about the same as the tax element of reward rates (on TOP of points you pay!). Is this a by-product of devaluation or what? Have you seen the same for other markets? You have to pay taxes on reward nights in Moscow? Apparently but not so hefty! OT – my Miles & More card has now finally arrived. I generally use a Lloyds Avios Amex/MasterCard for all purchases, but how does the DC card rate compare for points earning if i don’t have a particular preference for Avios or M&M miles, ie which should I use by default for sterling transactions? Once your Lloyds Avios card is replaced with the 0.4 Avios per £1 Mastercard the M&M card is clearly superior. However, that is only on paper. You really need a clear vision for your M&M miles. Unless you are very flexible and can book in their monthly mileage sales, the cheapest decent redemption is probably 35,000 miles for UK to Middle East in Business Class. There is no value in short haul flights with them. Thanks Rob. I’ve still not had any notification from Lloyds re the changes to their cards but i guess it will eventually happen. I should have 45000 M&M miles by the time the signup bonus arrives (do we know when they arrive? ), not that I’ve been chasing them as I’ve just done quite a few *A flights in the last few years. If I buy some Avios via Groupon Spain does it go into my Iberia account quickly? And can I transfer them to my BA account immediately? If your IB account is over 90 days old, yes (well, give it a day or so for the code). If not, no, as Combine My Avios is disabled until the 90 day point. Just tried moving Avios over from Iberia to BA (My Le Club AccorHotels reward points get dumped in there), and been told my details don’t match, despite both accounts being registered to the same postal address. Ah, Iberia somehow had my surname in twice, and I’d used different e-mail addresses for the two accounts. Really does need to be everything.